Benjamin Franklin. Paul McCartney. Kurt Kobain. Barack Obama. Leonardo de Vinci. All of them incredibly accomplished, historical individuals – all of them left handed people. 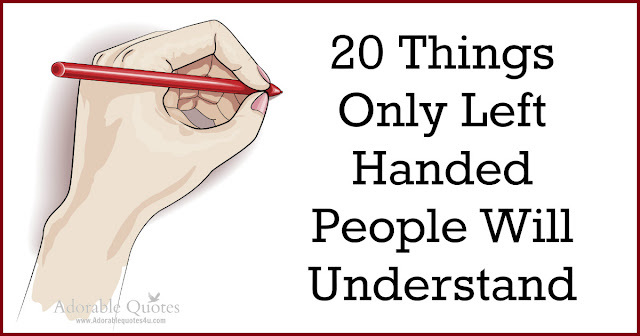 HERE ARE 25 THINGS THAT ONLY OUR LEFT HANDED COMPANIONS WILL UNDERSTAND. 1. WRITING CAN BE A PAIN. When lefties write, the must (obviously) move their hand left to right. When writing with a pen, they have to be careful not to smear ink! 2. LEFTIES HAVE THEIR OWN STUFF. Since so many things are designed for righties, left handed people have some things specially designed for them. Notepads, pens, scissors, and even can openers and boomerangs! 3. SITTING CAN BE UNCOMFORTABLE. Walk into any lecture hall and odds are that every desk has the writing platform on the right side. At dinner, lefties have to explain they’re left-handed to sit somewhere that’s comfortable for everyone. For those lefties who love video games, we know there’s some pain here. PlayStation, X-Box, Wii, and other electronic controllers are all made for righties. This hasn’t stopped them from dominating folks in this regard, however. It’s not just stick-shifting that requires some learning; the majority of important car switches and levers are on the right side of the wheel. This hasn’t stopped them from being better drivers, according to some sources. More and more keyboards have a number pad. This is a welcome addition for students and professionals who no longer have to use a separate calculator…unless you’re a lefty. Nearly every number pad is on the right side of the board. Let’s do this, lefties. The next time a well-meaning person sticks that hand out to shake, look ‘em straight in the eye and proudly extend your left arm. That’ll teach ‘em. How about those attached pens to that annoying phone cord? Lefties have to stretch most of them to capacity just to sign their name! Can openers are some of the worst enemies of left handed people. Any righty that’s tried to open a can with a manual can opener understands that it’s rarely smooth. Now, multiply this frustration by 10. Everything, from necklaces and bracelet clasts to belts, watches and coat buttons are annoying for lefties. Nearly every clothing item – even jeans – can be a nuisance to put on. T-shirt’s, sweatpants and hoodies are some of a lefty’s best friends. Remember those handy, spiral pages that we all carried around in school? Lefties do…because in addition to them having to worry about smearing their own writing, spirals don’t let them to write without getting a wired imprint on their hand. “Nope… its self-improvement month and I’ve decided to become ambidextrous.” Yes, righties, we know that left-handers are cool and rare, but they do exist. And just a bit of advice: lefties strongly dislike answering this question all the time. Okay, so this is a minor annoyance. But some of us enjoy having logos, text and other stuff on our writing instruments that we can read. Lefties have to read this stuff upside down. It’s rare to be a lefty. It’s even rarer to become a celebrity or someone famous. The odds of someone being a lefty and a celebrity are pretty much insane. So, when our left-handed friends find out someone they admire is a lefty it can be an exciting moment. When eating at a restaurant, lefties must re-arrange their entire setup. The silverware is always placed on the right side, as is the glass. At least lefties get their way at the buffet…unless the servers set the table, of course. BUT’S IT NOT ALL A PAIN…LET’S TAKE A LOOK AT 5 BENEFITS OF BEING A LEFTY. Researchers aren’t quite sure why, but lefties have a better chance at being highly intelligent. Some experts think that this may be because lefties are forced to use both sides of their brain more often. 20% of Mensa – the largest, oldest high-IQ society in the world – is made up of lefties, while counting for only 10% of the general population. This is especially true in boxing, baseball and tennis. Opponents simply don’t face left-handed competition often. When they do, it can throw them through a loop. An example: Manny Pacquiao is one of the great boxers of all time because his southpaw approach is so hard to defend. This is another area where researchers aren’t quite sure why, but lefties are better at managing multiple tasks. Again, experts say it could be because lefties must use both hemispheres of their brain more often. Research has shown that lefties are more likely to make the creative arts a career. So, to those left-handed artists, we extend our thanks in making the world a more aesthetically pleasant place to live!